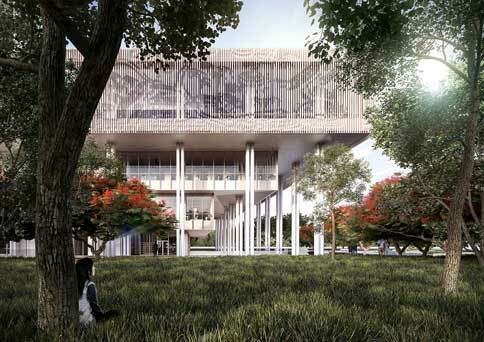 Dutch firm Mecanoo Architecten has been awarded commission to go ahead with their design for a new public library in Tainan, Taiwan. The practice will work alongside Taiwanese firm MAYU Architects+ for the project that will occupy 376,736 square feet. Aside from being a library, the space will feature a children’s area, public courtyard, cafe, conference hall, and a 200-seat auditorium. 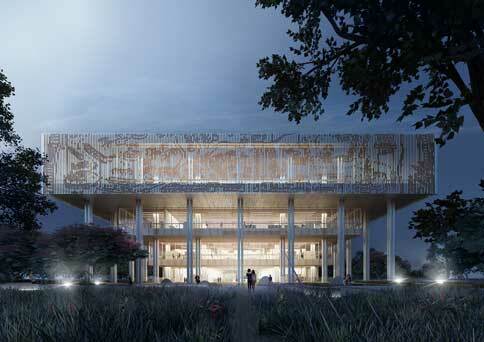 Within the library area itself will be specialized areas such as reading rooms, special collections, and study spaces. Mecanoo have established a strong pedigree when it comes to the library typology, with the well regarded Birmingham Library in the UK to their name along with another library scheme in the making in Manchester, also in the UK. Their design for the Tainan Public Library (its official title) aims to reflect the merging of cultures, generations, and histories within the site. A selection of natural materials including stone and wood consequently aims to attach the building to its locality. In addition, the city’s history will be depicted by an ancient map of Tainan transposed onto vertical louvres. The structure, when taken at a glance, also resembles that of Corbusier’s Villa Savoye, though on a bigger scale. Upon closer inspection, one can see the buildings perimeter expand at each level, supported by the stilts that follow the perimeter of the top floor. This system results in a canopy being able to offer shade all around the building, amplifying the threshold between the private interior and public exterior spaces. This schematic also effects the interior configuration too. The surrounding wooden fenestration filters sunlight entering the space, interacting and casting patterns on the stone floor. The building’s aesthetic is primarily orthogonal, so a curvaceous staircase offers a nice counter, acting as an anchor and reference point for circulation. An open plan scheme allows for adaptation, and Mecanoo has also allocated 139,930 square feet for future expansion. The project is set to cost $44 million and is due to be open to the public at the close of 2018.